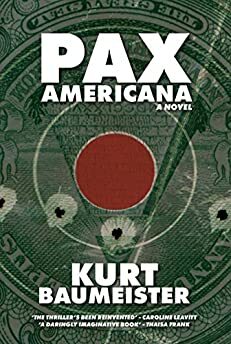 Kurt Baumeister’s literary thriller Pax Americana is a brilliantly imagined satire. To people who don’t write satire, it may seem easy. It’s just jokes, right? Or not even that, but painfully dry demi-jokes? Constant irony, mistimed whimsy, humor too smitten with itself to know better. Yeah, yeah, the world is a mess. So, what? Always has been. Always will be. Tell me something new. The thing people miss is that the satirist must be (or, at least, try to be) funny and serious at the same time. The balancing act can be extremely difficult, difficult enough it usually fails. To do it effectively, you must be willing to look at everything—the world, its things, its creatures, and most of all yourself—with something like love and contempt simultaneously. Pax Americana is a satirical take on the spy novel. Meaning it’s both a mockery of and an homage to the form. For me, there’s one writer of espionage thrillers, and one hero, who tower above the rest. The writer, Ian Fleming; the hero, James Bond. Now, I’ve read several Bond novels, the first of them in a bunch when I was a kid, then refreshing my memory of a few (notably Goldfinger and From Russia With Love) over the last several years. The most memorable things about the Bond books, other than Bond himself, of course, are the exotic locals, femme fatales, and larger-than-life nemeses that seem to fill his world. These qualities exist across the books and the movies. One that doesn’t, though, is the music. The Bond song has little to do with the Bond books, but it does provide a bridge between Pax Americana and my playlist. Whether this is just an incredibly clever fifty-plus-year marketing campaign or something more, the Bond songs are significant to our culture and, at least for me, “Live and Let Die” is one of, if not the greatest. From the wistful vocals and gentle piano of its beginning to the deadly shamble it reaches and maintains, this is an epic rock song. The first of two classic tracks for which I spent time deciding between the famous original and the only slightly less famous cover that came decades later. On the face of it, the arrangements seem similar between the Wings version and the cover Guns ‘N Roses did a few decades later, and the overall effect the versions go for, barely controlled musical chaos, is similar. Similar, but not the same. And if I must choose, and, indeed, I must, I’ll take the original. Listening to the two versions one after the other, you get the feeling Axl scream-singing the words acapella would only marginally add to or take away from the Guns version. McCartney’s version on the other hand is more soulful; ironically, more cohesive and rangier at the same time; vocals and instrumentation both necessary for the overall effect. Comparatively, G N R’s instrumentation sounds simplistic, tinny and thin in a way, for all the growling of Slash’s guitar. Maybe it’s the fact that Guns were just too far beyond chaos as a musical effect. Maybe they were chaos in a way that leaves someone else’s elegant descent into musical entropy sounding weak in their hands. Or maybe it’s the added poignancy, particularly in the beginning of the McCartney version, his willingness to work with rather than overwhelm the music that make his original shine, still after forty years. “Price Tag” captures one of the ironies at the heart of Pax Americana, but more importantly America and humanity. Deeply infectious and superficially positive, there’s more beneath the surface of “Price Tag” and a lot of it’s dark. Jessie J’s delivery of these lines is somewhere between careless and jaded, pointing to a reality that’s confirmed by the video’s dizzying array of costume changes and the ubiquitous “b-bling b-bling” and “cha-ching cha-ching” we’re shown in spite of what we’re told. Ultimately, the protestations are hollow. It really is about the “money money money.” But, what isn’t? If you’re trying to escape hypocrisy, humanity’s not a good place to do it. And, despite “Price Tag’s” hypocrisy, I guess, or at least I hope, Pax Americana has some of its attributes. I hope readers enjoy it, that they get swept up in the story, enjoy the plot, and find it a fast read. But I also hope they take away a hunger for greater truth, even though that hunger will invariably prove impossible to sate. “No need for Lucifer to fall if he’d learned to keep his mouth shut” is the payoff line. That’s quintessential Liz Phair, conveying a universal truth with sardonic simplicity. But that’s not all there is here. The song’s narrator doesn’t have to be Phair, but it could be, and certainly, if it were, the irony of a woman as beautiful as Liz Phair envying the “girls who live inside your world…just sitting next to mortals makes their skin crawl” is heavy. Ultimately, the song’s narrator, whether it’s Phair herself or a constructed character, feels a kinship with the fallen angel, Lucifer, in her realization of the universality, futility, and inescapability of envy. Pax Americana opens with its antihero, Tuck Squires, on the way to work at the U.S. Internal Defense Bureau (ID). A sunny November morning, and Tuck heads down Constitution Avenue in his green, reptilian, convertible Epiphany, top down, heat cranked, music blaring, the stereo system putting out “Salvation Serenade,” the latest from an entirely fabricated band, Jehovah’s Wishlist. Their lead singer being an equally fabricated figure, The Angelic Assassin, Rake Pennirex. I love making things up—part to most of the reason I’m a writer no doubt—from car brands to fictionalized movies and band names, actors and TV shows. So, it’s fitting that I start doing that on Page 1 of Pax Americana. I imagine Jehovah’s Wishlist as something like a cross between a Christian version of Arctic Monkeys and Creed’s nihilistic alter-ego. “Crunchy drums and martial guitars” is the way I describe them in Pax Americana—so basically punked-out Dominionist fascism, right? And who is Rake Pennirex? What does he look like? I’m thinking lots of black leather, long hair, and a crazy-thin moustache. And he’s British, definitely British. As discussed in the book, Missionary Situation Reversal, MSR, is a “God pop” band that Diana mistakes for country. Which horrifies the people she’s with, the men who are singing to her. The song’s significance will become clear later in the book, but in addition to alluding to a certain locale, it touches on the theme of gender imbalance (and even misogyny) in many of history’s great religions. Pax Americana’s villain, or antivillain, Ravelton Parlay, may be my favorite character to write. So much of Parlay’s world is either comedy, satire, or both; but when I try to think about him seriously, the refrain from this song comes to mind. At times, I can almost hear it when I’m writing him. It makes me sad. I think that if Parlay could hear it, too, he’d imagine I was likening him to Judas, and I probably am. This is the second track on which I debated between an original and its most famous cover. Yes, Bowie recently died, which makes it sort of sacrilegious to choose Nirvana’s version. But, at least on that score, Kurt Cobain’s life is a tragedy that stacks up to any, even two decades after his suicide. I like the instrumentation of the Nirvana version better. Which is probably just an example of more organic music catching up with the trippy studio tricks in Bowie’s version. The stripped-down version works for me. No, Cobain’s not nearly the pure singer Bowie is and perhaps this is another example of personal taste trumping good sense. In terms of having a distinctive voice, you really can’t make a case that McCartney measures up to Axl either. Listening to this song, I’m struck by how significant the lyrics are to me and how important they’ve wound up being to Pax Americana. This shouldn’t be too much of a surprise. Anyone who knows me well knows that U2 are my favorite band. No, that’s not cool to say these days, and their last album was a bit of a mess. Still, in writing this, I actually found myself pulling the entire sheet of lyrics, then editing down to what seemed a reasonable level; which still amounted to about half the song. Nothing remotely like a reasonable level. Pax Americana is based on the premise that America swerved right under George W. Bush (which it did) then just kept going and going and going. And there’s little as generally right—and mainstream white—as country music. Now, I don’t particularly like country music, but I can get into Bono’s lyrics as he simultaneously makes fun of it and himself for going down this road. Yet, somehow, he still manages to touch on the fact that there may be some legitimate soul in country. You have to listen deeper into this song but the country music theme returns—”it’s the stuff, it’s the stuff of country song, yeah but I guess that’s somethin’ to go on”— their expression different, their meaning more profound. Rather than the presumption that U2’s lyrics are overtly Christian, their lyrics have always been about the contradictions of faith, the push and pull between the fraud religion often represents and the idea of actually doing good in the world. The last line about the cartoon network turning into the news speaks to the absurdity of reality, and the plausibility of surrealism, a notion that seems very important in our current political environment in America, a place where facts, logic, and learning seem now to be under daily assault from the highest, most powerful places in our government. Much of Pax Americana is about separating religious dogma from the values necessary to do good. It’s about the absurdity of religious fundamentalism of any stripe. Though there can be no absolute certainty that one of the extreme fundamentalist interpretations of religion isn’t correct, the preponderance of evidence suggests that no fundamentalist view can be true since that would preclude every other religion being even a little bit right. The notion of an omnipotent, benevolent God that so many religions posit would seem to be at odds with the idea that God is some glorified accountant, keeping score, consigning the spiritual failures—which let’s be honest, is most of us—to an eternity of torment. If anything is true about religion or spirituality, logic dictates that beliefs can only be true in their commonalities (e.g. The Golden Rule). This is what’s at the heart of Diana Scorsi’s software, Symmetra. “Lambs to the Lord” is set to the tune of “Knick Knack Paddy Whack” (aka “This Old Man”), and shows up at a gallingly inappropriate time in the text, bedeviling an already bedeviled Dr. Diana Scorsi and resulting in pained singing and lumbering dancing from a certain gigantic, evangelical henchman. Perhaps the most misunderstood song in the history of rock ‘n roll—so misunderstood the very misunderstanding is famous—”Born in the USA” may be the best example in this whole playlist of the duality of intent that goes with satire. “Born in the USA” has to be anthemic. It has to sound like a sort of love letter to America, a chest-thumping, fist-bumping apple-pie buy- Chevrolet barbecued chicken of a song, and it even is on some level. Its true meaning, though, as a song of men who gave themselves to their country and were reviled in return is inescapable if you spend more than a second thinking about the lyrics. “It’s the End of the World as We Know It (And I Feel Fine)” by R.E.M. In Melbourne, Victoria, a little more than a week before 9/11, I saw an Australian thrash band play a sped-up version of this. It may have been the most exciting (musical) two minutes of my life. Blundering around Oz, smoking and drinking and, at times, playing the stupid American, I had no idea what the U.S. and the world were in for in a few days’ time. The events of 9/11/01 are certainly significant to Pax Americana, just as they are to history. But for that attack, America would have gone on believing itself immune to the terrorism of religious extremists. That didn’t happen of course. I came into Boston’s Logan Airport on one of the planes that would, a week later, be used in the 9/11 attacks. I lived in Boston, so there was no chance I would have been heading to New York on one of those fateful trips, even if I’d returned a week later. Still, the proximity, remote though it is, shakes me to this day. Hope doesn’t necessarily make sense, but I’ve still got it. And I…well, hope…that comes through in Pax Americana. Despite all the darkness, not only in our world, but in my novel, there’s no choice but to have hope. Nor is there any choice but to laugh at reality’s rules, things like mortality, the mystery of life after death, our dubious reliance on gods, and all the other uncertainties we live our lives around. Having listened to Bob Marley’s “Redemption Song” hundreds of times, my main takeaway is that you can’t fully control your reality, much as you might try. Maybe this desire to control, to make the world in one’s own image is at the heart of the philosophy held by various villains in Pax Americana, and maybe that philosophy more than anything else is what we have to fight against. There may not be a god—there almost certainly isn’t—but to the extent one exists, there’s no reason to believe it’s anything but good. I don’t mean there’s no logic in it. I mean that as Marley says, there’s no purpose in it. We make our own prisons. We put ourselves in them. These are horrible truths. The corollary truth is that we can free ourselves from our prisons. Even those of the horrible, hateful gods some of us create. In the end, we’re the only ones who can.